Manager Graham Alexander celebrated his first home game in style by guiding Scunthorpe to a thumping victory over Swindon - their biggest win since 2003. Conor Townsend's strike and a deflected shot by fellow full-back Jordan Clarke put the Iron in control at the break. A low strike by Hakeeb Adelakun and Tom Hopper's left-foot effort made it 4-0. 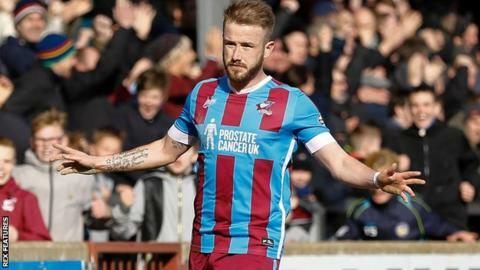 And Paddy Madden's 21st goal of the season was followed by a Hopper header to seal a win which takes the hosts to within six points of the play-offs. Swindon, who were beaten 4-1 by Wigan on Easter Saturday, are nine points clear of the League One relegation zone. Match ends, Scunthorpe United 6, Swindon Town 0. Second Half ends, Scunthorpe United 6, Swindon Town 0. James Brophy (Swindon Town) wins a free kick in the defensive half. Foul by Josh Cooke (Swindon Town). Substitution, Scunthorpe United. Levi Sutton replaces Luke Williams. Attempt saved. Paddy Madden (Scunthorpe United) left footed shot from the left side of the box is saved in the top centre of the goal. Substitution, Swindon Town. Josh Cooke replaces Fabien Robert. Goal! Scunthorpe United 6, Swindon Town 0. Tom Hopper (Scunthorpe United) header from the left side of the box to the bottom left corner. Assisted by David Mirfin. Corner, Scunthorpe United. Conceded by Bradley Barry. Attempt saved. David Mirfin (Scunthorpe United) header from the centre of the box is saved in the top centre of the goal. Attempt missed. Nicky Ajose (Swindon Town) right footed shot from the centre of the box is too high. Attempt missed. Murray Wallace (Scunthorpe United) header from the centre of the box is just a bit too high. Attempt missed. Raphael Rossi Branco (Swindon Town) header from the centre of the box misses to the left. Goal! Scunthorpe United 5, Swindon Town 0. Paddy Madden (Scunthorpe United) right footed shot from the centre of the box to the bottom right corner. Assisted by Hakeeb Adelakun. James Brophy (Swindon Town) wins a free kick in the attacking half. Corner, Swindon Town. Conceded by Luke Daniels. Attempt saved. Louis Thompson (Swindon Town) right footed shot from the left side of the box is saved in the top right corner. Goal! Scunthorpe United 4, Swindon Town 0. Tom Hopper (Scunthorpe United) left footed shot from the centre of the box to the bottom right corner. Assisted by Hakeeb Adelakun. Attempt missed. Hakeeb Adelakun (Scunthorpe United) right footed shot from the centre of the box misses to the right. Corner, Scunthorpe United. Conceded by Ellis Iandolo. Goal! Scunthorpe United 3, Swindon Town 0. Hakeeb Adelakun (Scunthorpe United) right footed shot from the left side of the box to the bottom right corner. Assisted by Jamie Ness. Second Half begins Scunthorpe United 2, Swindon Town 0.